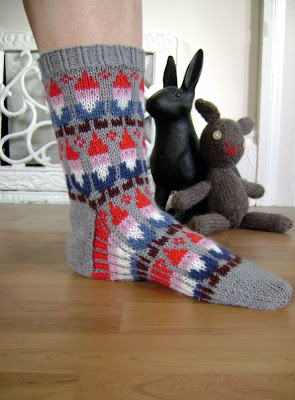 spillyjane knits: Gnome Socks are out! The Gnome Socks are out, right on time! Now you can wear gnomes on your toes! You've been waiting a long time for this! Because as they say: "Happiness is a warm gnome." September 4, 2010 at 3:33 a.m.
September 4, 2010 at 8:14 a.m.
Too cute! Must overcome my fear of colorwork and make some. September 5, 2010 at 11:03 a.m.
October 14, 2010 at 11:17 a.m.